Coslys Organic Rose Face Scrub exfoliates gently dry and sensitive skins with its creamy texture. Micro-beads of jojoba eliminates dead cells and impurities. Coslys Organic Face Scrub contains Organic Jojoba Oil and Organic Aloe Vera to protect and rejuvenate. Your skin is smooth and glowing ! 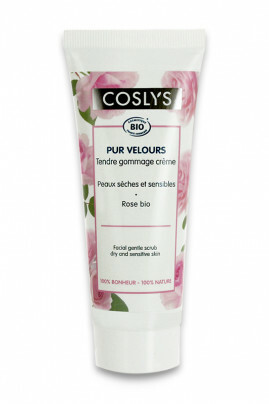 Once a week, apply COSLYS Organic Rose Face Scrub using circular motions on wet skin, avoiding eye contour area. Rinse abundantly with clear water. Follow by applying Coslys Moisturizing Face Mask. Smooth and luminous skin thanks to Coslys organic face scrub ! Aqua (water), caprylic/capric triglyceride (emollient from coconut and vegetal glycerin), spiraea ulmaria flower extract* (meadowsweet floral water), cetearyl alcohol (emulsifier from coconut and glycerin), glyceryl stearate SE (emulsifier from coconut and palm-kernel), jojoba esters (jojoba beads), simmondsia chinensis (jojoba) seed oil* (organic jojoba oil), cetearyl glucoside (vegetal emulsifier), rosa damascena flower extract* (organic rose extract), aloe barbadensis leaf juice powder* (organic aloe vera extract), chondrus crispus (carrageenan) (thickener), glucose (sugar), xanthan gum (thickener), glycerin (vegetal glycerin), parfum (100% natural fragrance), benzyl alcohol (conservative), dehydroacetic acid (conservative), citric acid (pH regulator), linalool, limonene (components naturally present in the fragrance).